Mention Shure and most people will think of the American brand’s excellent range of handheld stage microphones. 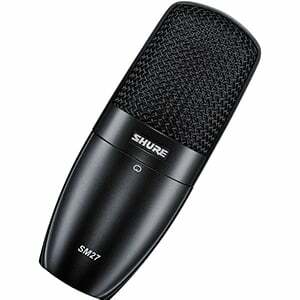 However, Shure also offers some pretty decent studio models as well – including the SM27, which is undoubtedly one of the most attractive condenser microphones you can find for less than $300. Here’s the full breakdown of this solid mic! Even though the SM27 has a pretty minimalist look, there is something very stylish about it. Instead of opting for a classic tubular design – as many other brands do – Shure has gone with an oblong chassis, with an all-black finish, disturbed only by the Shure logo on the front. The grille is also entirely black and features a side-address pattern with a three-layer mesh cover. So, while the subtle aesthetics are nothing to write home about, it’s a good-looking mic that will happily fit into any studio lineup. What sits inside the SM27 is a little more exciting and Shure’s choice of hardware speaks volumes about what this mic was designed to do. Firstly, we have a super low-mass large Mylar diaphragm, covered with a very thin layer of 24-karat gold. Then comes an all-round excellent Class-A preamp with solid components, which all combines to deliver a sturdy condenser mic that’s capable and extremely flexible. Additionally, the SM27 comes with a three-position low frequency filter, an attenuator switch (-15dB), a fixed cardioid polar pattern, a standard XLR connection, and a built-in pop filter. When it comes to specs, the SM27 features a frequency response range of 20Hz to 20kHz and a high max SPL value of 152dB. Finally, the mic is shipped with a rock-solid shock mount and a basic velveteen Shure-branded bag. This mic is certainly a workhorse, with a very solid performance for the sub-$300 price tag. The defining feature of the SM27’s performance is its flat response, which is largely down to the low-mass diaphragm. Its ability to handle high SPL values opens up its flexibility when it comes to recording instruments. Despite this, vocals are still this mic’s forte. Due to its transparency, the SM27 tends to suite a wide array of instruments and vocal profiles, spanning from deep male voices to higher-pitched female ones. The SM27 adds a decent amount of midrange warmth, but not to a point where it changes the nature of your voice – it just makes it sound a little better, and that’s something we can all appreciate. With the Shure SM27, you have a serious recording tool at your disposal. For a general-purpose condenser microphone, it is near perfect – the type of mic you can stick in a studio and relax, knowing it will cover almost all of your recording needs. Well worth adding to your mic shortlist! 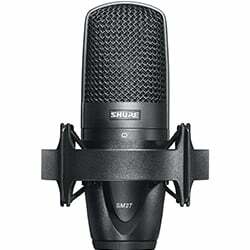 For more info about the Shure SM-27, click here. For more Condenser Microphone Under $300 you might like, click here.